Books and scores can be purchased on-line through PayPal. If ordering by mail, please specify what you are ordering by title and quantity. Each piece listed below has a playing level reference. Determining skill level is somewhat subjective so the levels listed are in relationship to each other. It is assumed that the player is not a complete novice when playing the level 1 pieces (hopefully you will have completed "Music and Guitar: Melody and Harmony" or an equivalent course of study). This level 4 piece with its Spanish flavor captures her dancing and her dreams. The Fountain -- this intermediate level 2 piece in running triplets - a favorite with listeners and students - captures the sounds of water in motion -- some hear a fountain, others hear a brook, a waterfall, or a rainstorm. Hawken -- This piece has a Western/Native American feel to it as you imagine it is 1825 and are riding across the Great Plains with your trusty Hawken rifle to the high lonesome of the Rocky Mountains. Peasantry -- a quick little level 1 piece in a Rennaisance style -- with a slight dark side to it. Seabreeze -- an early intermediate level 2 piece of standing on a beach with a light breeze, a sailboat in the distance, and gulls drifting on the air. 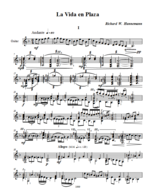 Fireside Reverie -- this intermediate level 2 piece is a bit deceptive. The chords are simple enough -- Dmaj7, Cmaj7, Bb6, Gmaj7 -- but the rhythms can be tricky and the passage work is very quick in the middle. Here are scores (printed sheet music) for the songs I have written. You can purchase these individually in pdf format through PayPal. Thank you. Hannemann Music is pleased to announce the second book in the "Music and Guitar" series, "Melody and Harmony" is now available. Q. 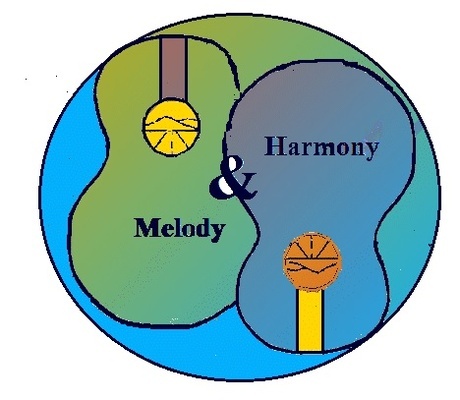 What makes Melody and Harmony different from all the other method books out there? A. 1) Most method books focus on the mechanics/techniques of playing the guitar -- and totally forget about the Music! 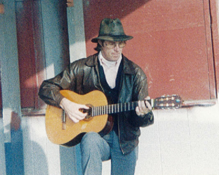 The Music and Guitar series was written to teach the music concurrently with the instrument -- musical knowledge is logically partnered with technique. 2) Most method books seem to assume that you will have a teacher to teach and explain what isn't in the book. The Music and Guitar series is written to teach you exactly what Mr. Hannemann teaches his students -- the text is Mr. Hannemann speaking to you directly. Q. What will I learn in Melody and Harmony? A. 1) Accompaniment Guitar Playing: you will learn to read and understand chords and accompany your singing (or any other instrument) either strumming or with arpeggios (finger patterns). 2) Solo Instrumental Guitar Playing: If you have already completed Fundamentals you know how to read notes and where they are on your guitar. Now you will learn how to play pieces written for solo instrumental guitar, starting from a very simple melody, then adding a bass line, then adding chords, then varying the melody while adding arpeggio playing of the chords to enrich the guitar arrangement. 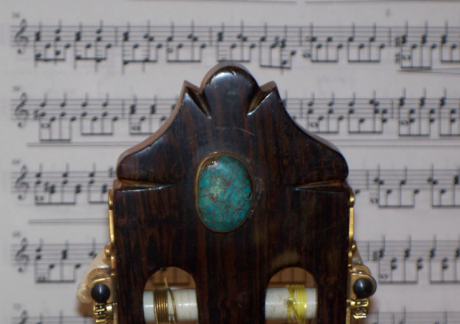 Techniques include the roll, hammers and lifts, the rasquedo, the palm mute, natural and artificial harmonics. 3) Music and musicianship: As part of your on-going ear training you will learn to play, hear, and recognize most of the basic intervals. You will learn to spell, read, finger and use major, minor, diminished, 7, maj7, and 9 chords (and you will learn what those are). You will be introduced to counterpoint; melodic structure and melodic variation; and simple harmonization and variations to that harmonization of a given melody. Q. Wow!, that's a lot! How long will this take? Will it be difficult? A. Most of my students having completed Fundamentals will get through the material in Melody and Harmony in 6 - 10 weeks (depending on how much they practice). Like Fundamentals, Melody and Harmony presents a series of simple short Lessons, many only one page in length, others 2 - 3 pages long. Each Lesson focuses on only one element. A. Nope. You can learn all of this in one piece. Theme and variations is a favorite vehicle for composers to write and teach music. You start with a simple melody and then add to it and change it through several variations which increase its complexity. In our case that single simple melody is Twinkle -- with 7 variations (including a bit of the blues). Raggedy Shoes Blues -- this intermediate level 2 piece in 6/8 has a nifty paired 1/4 note 1/8 note rhythm which gives it a nice bounce as you go kickin' down the street in your raggedy shoes without a care in the world. Season of the Wolf -- this intermediate level 2 piece, based on milongas and the tango, can be played either as a tango with a lot of attitude or as a depiction of a wolf in winter as it prowls through the trees and crosses a frozen meadow to disappear once again into the forest. California - early advanced level 3 - similar to "Morningstar" but longer with a more complex rhythm and quick passage work in the center of the piece. 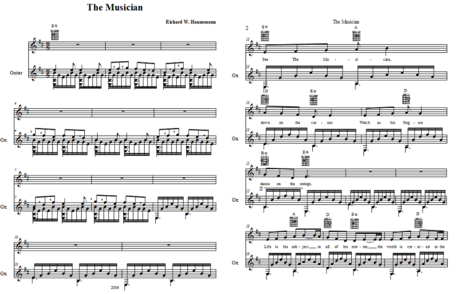 The Musician -- the level 3 instrumental version of the title track from my album "The Musician"
High Valley Cafe - the level 3 instrumental version of the song track from my album "The Musician". The Juggler -- An instrumental version of my song "The Juggler". Imagine a summer day and evening in a small town and a small traveling circus rolling in to provide some summer magic -- the lyric being "An old man dressed in raggedy patch clothes, a magical juggler he; with a twinkle in his eye he sets his orbs to flying high and free". This level 4 has a quick running arpeggio in 16ths, equally quick grace notes and chord changes to give it a bright circus-y lilt. Flotsam and Jetsam -- This level 4 is a fairly dark piece in Dm. It is the instrumental version of a song I wrote about the life and death of a beach transient. Diogenes -- If you know the Greek story of Diogenes or the Biblical story of Lot then you know what this piece is about. A hard and harsh driving 1st theme with a fast moving bass line necessitating some difficult left hand work making the piece a level 5 interweaves with a slower haunting 2nd theme which combine to a cataclysmic finish. This is a collection for the guitarist of the 8 songs and 4 instrumentals heard on the album The Musician. Complete notation and chord diagrams makes it easy to sing and play the music exactly as Richard Hannemann does in his concerts. La Vida en Plaza is a 444 measure work for solo guitar in 3 movements for the advanced guitarist. Each movement reflects an aspect of life on and around a spanish plaza -- La Vida I speaks of lovers dancing and others strolling about the plaza; La Vida II speaks of a funeral at the cathedral on the plaza; and La Vida III is a celebratory fiesta. The piece had its premiere performance to good reviews Sept 014 in Los Alamos, NM.